Angiogenesis underlies tumour growth and metastasis through hepatocyte growth factor (HGF), epithelial growth factor (EGF), and vascular endothelial growth factor (VEGF). The aim of this study was to determine the levels of VEGF, EGF, HGF, HGFR (hepatocyte growth factor receptor), and SRSF1 (serine-rich protein splicing factor-1) in patients with parotid gland tumours and in healthy controls via ELISA in parotid saliva. 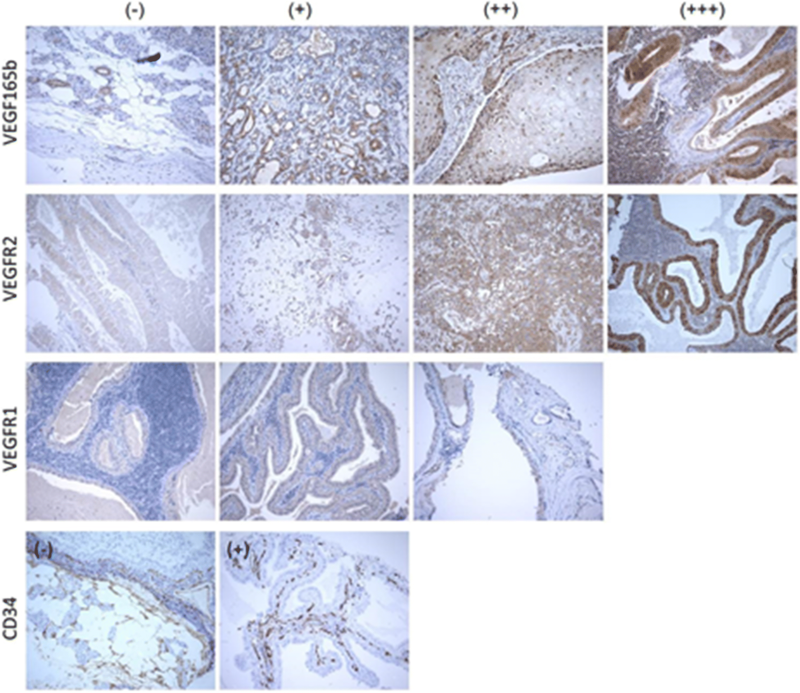 Immunohistochemical expression of anti-angiogenic isoform of VEGF165b subunit, VEGFR1, VEGFR2, and microvessel density (CD34) were assessed in the tumour tissue and in the non-tumorous surrounding margins. The study included 48 patients with benign and malignant parotid gland tumours and 15 healthy controls. Comparison of VEGF, EGF, and HGF in tumour and non-tumorous tissues showed no significant differences and no correlations with tumour stage. The salivary VEGF concentration was significantly higher in patients with pleomorphic adenoma and Warthin’s tumour. No significant correlation was found between expression of VEGF165b and VEGFR2 in tumours and non-tumor surgical margins. The increased salivary VEGF reflects changes in affected parotid glands, but it cannot be used as a prognostic and differentiative factor for parotid tumours. Reciprocal relations between growth factors suggest an overlapping pathway of secretion and activity. Tumours of the salivary glands are uncommon, accounting for 3–6% of all head and neck tumours [1, 2]. Approximately 70% of all salivary gland tumours originate in the parotid glands [1, 2, 3], and most are benign, particularly mixed tumours (pleomorphic adenoma) and Warthin’s tumour (adenolymphoma) . Only 15–32% of parotid gland tumours are malignant , the most common being mucoepidermoid carcinoma and adenoid cystic carcinoma (ACC), accounting for 22 and 34% of cases, respectively . Angiogenesis and tumour dissemination via the blood vessels are biological processes that lead directly to primary tumour growth and metastasis. These processes are associated with the secretion of angiogenic growth factors and are often, but not always, correlated with clinicopathological features . Several growth factors—including hepatocyte growth factor (HGF), epithelial growth factor (EGF), and vascular endothelial growth factor (VEGF)—are known to be involved in the pathogenesis of salivary gland tumours . In both normal and neoplastic cells, HGF provides a strong mitogenic influence on cell motility; it is a powerful angiogenetic factor and exerts powerful anti-apoptotic activity. HGF is typically involved in tubular neoplasms, such as adenocarcinoma . EGF is overexpressed in a variety of epithelial tumours, including salivary ACC. It has been shown to increase cell motility by means of in vitro invasion, and it has metastatic potential in several tumour types . VEGF also exerts a mitogenic effect on endothelial cells and has been shown to play a central role in key signaling pathways that mediate angiogenesis, tumour growth, and metastasis. VEGF has been implicated in intratumoral microvessel density (MVD) and metastatic spread, and for these reasons, it is considered a prognostic factor for many cancers, including salivary gland tumours and oral squamous cell carcinomas [1, 8]. However, research on the relation between VEGF expression and prognosis in salivary gland carcinomas is limited [8, 9]. VEGF binds to its receptors (VEGFR1, VEGFR2, and VEGFR3) to fulfill its biological function. Two families of VEGF proteins are formed by an alternative splice-acceptor-site, which gives two sequences differing in their angiogenic properties [10, 11, 12, 13]. These two isoforms bind to VEGFR2 with the same affinity, but the binding of VEGF165b results in an insufficient tyrosine phosphorylation/activation of VEGFR2 and incomplete or transient downstream signaling. This process leads to an impaired angiogenic response [10, 13]. The balance of the proangiogenic and anti-angiogenic isoforms of VEGF may play a crucial role in controlling angiogenesis in normal status; however, the mechanism regulating expression of pro- and anti-angiogenic isoforms of VEGF is not known. In this process, serine-rich protein splicing factor 1 (SRSF1) can change the proportion of VEGF165 and VEGF165b and regulate alternative splicing . Changes in the quantity of these isoforms might be involved in pathological angiogenesis. Most research has focused on VEGF165 and VEGF165b and their influence on cancerogenesis by means of MVD [13, 14, 15, 16, 17]. Although angiogenesis is difficult to measure directly in human tumours, there is increasing evidence that MVD may be an indirect marker of angiogenesis. One of the most common antibodies used for microvessel staining is CD34, which has been used in immunohistochemical studies to evaluate intra- and peri-tumoural changes induced by VEGF [18, 19]. Despite the progress made in recent years in understanding the molecular drivers of angiogenesis and tumour growth and dissemination in salivary gland tumours, more data are needed to better elucidate the relationship between the expression of growth factors and prognosis [8, 9]. To address this need, we measured levels of VEGF, EGF, HGF, HGFR, and SRSF1 in the parotid saliva of patients with benign or malignant parotid gland tumours and in healthy subjects. We elected to use saliva sampling for the following reasons. First, saliva is rich in serine/arginine rich proteins, which is why we choose this regulator of alternative splicing. Second, saliva contains VEGF, HGF, EGF, and HGFR and reflects the concentration of these molecules in serum. Additionally, the blood supply of salivary glands influences saliva composition and flow. Finally, saliva is easily obtainable and may reflect changes associated with tumour growth in the salivary glands. The main aim was to determine the prognostic potential of these markers. Additionally, we explored possible correlations between the concentrations of VEGF165b, VEGFR1, VEGFR2, and CD34, measured by immunohistochemical study, in both benign and malignant parotid gland tumours and in non-tumour tissue. The study comprised 48 patients diagnosed with a parotid gland tumour. Of these, 41 patients presented benign tumours (mixed tumour in 20 patients and Warthin’s tumour in 21) and 7 had malignant tumours. Fifteen healthy subjects (HS) were included as healthy controls. All patients underwent surgical treatment of the primary tumour at the Department of Head and Neck Surgery, Greater Poland Cancer Center (GPCC), Poznan University of Medical Sciences, Poland. Exclusion criteria included the presence of lymphoma, previous parotid gland surgery, or other parotid gland pathologies. Clinical examinations include ultrasound and, in selected cases, computed tomography (CT) or magnetic resonance imaging (MRI), to confirm the diagnosis. All tumours were described by location and size. Additionally, malignant tumours were evaluated for stage (7th edition of American Joint Committee on Cancer TNM staging), level of differentiation, regional lymph node metastasis status, and grade . Tumour diagnosis was performed by pre- and postoperative histopathological examinations. Immunohistochemical study was performed using archived paraffin-embedded tissue samples. The tumor diagnosis was performed independently by two pathologists. Disease-free tumor resection margins, located at least 2 cm from the tumour, were used as controls. The protocol for this study was approved by the Bioethics Committee of Poznan University of Medical Sciences, Poland (number 744/11). All patients provided signed written informed consent. Parotid saliva was collected from all patients directly from the affected parotid gland by opening with Lashley cups into Eppendorf tubes after stimulation with 3% citric acid before surgery. Two hours before sampling, patients and healthy controls refrained from eating, drinking, mouth rinsing, and teeth brushing. The saliva was stored at − 70 °C. Measurement of VEGF, EGF, HGF, HGFR, and SRSF1 levels in parotid saliva. VEGF165, EGF, and HGF levels in saliva were determined by ELISA (R&D Systems, Minneapolis, MN, USA) with a sensitivity of less than 5.0 pg/mL for VEGF165, 0.7 pg/mL for EGF, and 40.0 pg/mL for HGF. Soluble SRSF1 and HGFR levels in parotid saliva were also determined by ELISA (EIAab SCIENCE, Wuhan, China) with a sensitivity of less than 0.078 and 78.0 pg/mL, respectively. Absorbance was measured with a ELx800 96 well Microplate Reader and KC junior software, v.1.11 (Bio-Tek Instruments, Vermont, USA). Tissue microarray (TMA) paraffin blocks were prepared to evaluate the selected protein expression in the same location in the primary tissue sections. The primary paraffin-embedded tissue sections (donor blocks) were re-embedded into paraffin-wax tissue blocks. Two tissue cylinders (2 mm in diameter) from each case were selected from the “donor blocks,” punched from marked regions, and subsequently placed into the recipient TMA blocks using 3DHISTECH TMA Master (v1.14, 3DHISTECH Ltd., Budapest, Hungary). The paraffin blocks were cut into 4-μm tissue sections using a rotary microtome (Accu-Cut ®SMRTM200, Sakura, Japan). To establish immunohistochemical procedures, a series of positive control reactions were performed by determining the presence of antigens (The Human Protein Atlas, http://www.proteinatlas.org). The negative control reactions were performed on additional tissue sections during proper immunohistochemical staining, by substituting the primary antibody for a solution of 1% bovine serum albumin (BSA) in phosphate buffered saline. Immunohistochemical staining was performed according to protocols described in detail elsewhere . Immunohistochemical staining of selected tissue sections was performed using the monoclonal antibodies listed in Table 1. Epitopes were unmasked by Epitope Retrieval Solution high-pH (Dako) and then the slides were incubated overnight (16 h) with a primary antibody at 4 °C. Detection of the antibody complex was carried out with EnVisionFlex Anti-Mouse/Rabbit HRP Labeled Polymer (Dako). Antigens were localized according to the presence of a brown reaction product, using DAB as a chromogen. Finally, the sections were counterstained with hematoxylin, dehydrated in increasing grades of ethyl alcohol (80, 90, 96, and 99.8%) and mounted with the Shandon Consul Mount (Thermo Scientific, Waltham, USA). The results were analyzed using a light microscope (ECLIPSE E800; Nikon Instruments Europe, Amsterdam, the Netherlands), and the level of expression was estimated using morphometric principles. To assess the level of determined protein expression, we used the modified Remmele-Stegner scale (Index Remmele-Stenger IRS—immunoreactive score), according to the intensity of expression and the number of cells/tissue area positively expressed in our previous publication . Expression of VEGF165b, VEGFR1, and VEGFR2 was localized in the cytoplasm and graded as follows: −, negative; +, weak positive staining; ++, moderate positive staining; and +++, strong positive staining. Expression of CD34 was assessed as a positive (> 5 blood vessels in the field of view) or negative (< 5 blood vessels in the field of view) staining. Figure 1 presents representative immunohistochemical staining of VEGF165b, VEGFR1, VEGFR2, and CD34 and positive cytoplasmic staining (brown). Figures 2 and 3 present a representative immunohistochemical staining of VEGF165b, VEGFR1, VEGFR2, and CD34 in selected tissue section. The calculations were carried out with Microsoft Excel 2010 and STATISTICA software (v.10, StatSoft Inc., Tulsa, OK). Distributions of continuous variables were evaluated for normality using the Shapiro-Wilk test. Depending on the number of groups analyzed, the differences between them were tested using the Mann-Whitney U test or Kruskal-Wallis one-way analysis of variance (ANOVA) by ranks followed by post hoc multiple comparisons of the mean ranks. Spearman’s rank correlation analysis was used to determine associations between the concentrations of selected molecules. Unless otherwise stated, the results are expressed as medians with interquartile ranges (IQR). Categorical variables are presented in contingency tables and their associations were tested, depending on the number of cases, with Fisher’s exact test. For paired nominal data, McNemar’s test with the continuity correction was used. P < 0.05 was considered statistically significant. All subjects were of Caucasian origin and treated at the GPCC. Table 2 presents the clinical profile of the patients. The median age of the healthy subjects (10 women/5 men) was 23 years old (5). Expression levels of VEGF, EGF, HGF, HGFR, and SRSF1 in parotid saliva. In the patients with pleomorphic adenoma or Warthin’s tumour, salivary VEGF levels were significantly higher than in healthy controls (p = 0.0057, p = 0.0070, and p = 0.0160, respectively) (Table 3). There were no differences between the study groups in salivary levels of EGF, HGF, HGFR, and SRSF1. No significant correlations were observed between any of the demographic or clinical factors and levels of VEGF, EGF, HGF, HGFR, and SRSF1. Statistically significant correlations were observed between VEGF and EGF and between SRSF1 and HGFR salivary levels in patients with malignant tumours (p = 0.0137 and p = 0.0212, respectively) (Table 4). Significant correlations were also found between VEGF and EGF (p = 0.0003), SRSF1 and VEGF (p < 0.00001), as well as between EGF and HGF and between EGF and SRSF1 (p = 0.0107 and p = 0.0016, respectively), and between SRSF1 and HGFR (p = 0.0197) salivary levels in patients with pleomorphic adenoma (Table 4). Moderate but statistically significant correlations between VEGF and SRSF1 and between VEGF and EGF salivary levels were also found in patients with Warthin’s tumour (p = 0.0001 and p = 0.0161, respectively) (Table 4). There were no differences in protein expression of VEGF165b, VEGFR1, VEGFR2, and CD34 in malignant tumours, pleomorphic adenomas, or Warthin’s tumour (Table 5). However, a significant difference was observed between distribution of VEGFR2 and VEGF165b (Table 6). No significant differences in the expression of selected proteins located in the tumour and the surgical margin in the same patient were observed (Table 7). Finally, no significant association was found between patient’s clinicopathological data and immunohistochemical expression of the study molecules (Table 8). Although it is clear that there is a relationship between the expression of certain growth factors, angiogenesis, and the development of salivary gland tumours, the exact nature of these relationships remains to be fully elucidated. In the present study, we analyzed salivary and tissue levels of VEGF, HGF, EGF, HGFR, and SRSF1 to determine their potential value as prognostic and differentiating markers for benign and malignant parotid tumours. We also assessed levels of VEGF165b, VEGFR1, VEGFR2, and CD34 to check for correlations in tumour and non-tumorous tissues, finding no difference between the expression of these growth factors in these different tissues. Likewise, we were unable to find any correlation between the growth factors and tumor stage. However, the levels of salivary VEGF were significantly higher in patients with pleomorphic adenoma and Warthin’s tumour compared to healthy subjects, suggesting that salivary VEGF could be used as an additional tumour marker and that its presence indicates pathological changes induced by tumours in the affected parotid glands. Finally, no significant correlation was seen between immunohistochemical expression of VEGF165b and VEGFR2. Taken together, these findings suggest that among salivary growth factors, VEGF is the most sensitive factor. However, it is not a prognostic and differentiating factor in parotid tumours. The balance of proangiogenic and anti-angiogenic factors does not seem to influence the development of tumours of parotid glands. The only growth factor that presented significantly higher salivary levels in patients versus healthy controls was VEGF, and these levels were independent of the tumour type (i.e., benign vs. malignant) in our cohort. Previous studies have demonstrated increased VEGF expression in salivary ACC versus control groups and those same studies have shown that overexpression correlated with advanced TNM stage, perineural invasion, recurrence, and worse prognosis [3, 5]. The relatively young age of our control group may have reduced the possible differences between salivary levels of growth factors in the healthy controls versus the patients because growth factor levels are usually higher in younger people; thus, the relatively young and homogenous age of the control group in our study may have affected the comparisons between the controls and patients. In salivary gland carcinomas, VEGF expression has been correlated with p53 expression, commonly mutated tumour suppressor gene in solid tumours and in oral squamous cell carcinomas and salivary gland tumours . According to Li et al., VEGF can be considered an additional prognostic parameter in salivary gland carcinomas . VEGF can stimulate angiogenesis in tumour tissue and induce the endothelium to secrete collagenase, leading to the degeneration of the basal membrane; furthermore, due to the high permeability of new vessels, plasma protein is extravasated, providing stroma and nutrients for tumour growth and more neovascularization. This autocrine mechanism may be responsible for elevated levels of VEGF in parotid saliva from a cancerous salivary gland. Other studies have found that serum VEGF levels are higher in patients with salivary gland tumours and squamous cell carcinomas [23, 24, 25], particularly in malignant tumours when compared to benign tumours and to healthy subjects [23, 26]; in addition, higher VEGF levels were associated with higher serum concentration of metalloproteinases and disintegration of extracellular matrix [23, 27, 28]. 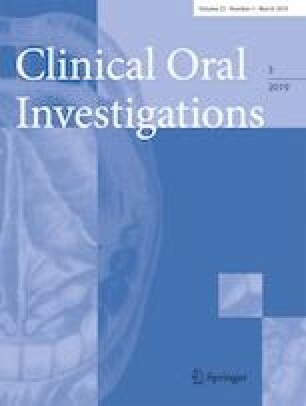 We believe that the serum VEGF levels reported in previous studies provide a more sensitive measure of malignant parotid tumours, whereas increased salivary levels of VEGF, determined in our study, can be due to systemic and/or local changes in the affected parotid glands caused by the tumour regardless of whether it is malignant or benign. Interestingly, we found no correlation between salivary VEGF levels and clinicopathological features such as tumor stage or size, nodal status, and histologic grade. Similarly, we found no differences between patients and healthy controls in terms of salivary EGF, HGF, or HGFR, in contrast to data from other studies indicating elevated expression of EGF and HGF and their receptors in salivary gland tumours [29, 30]. However, due to the small number of patients with malignant tumours in our sample, it may not have been possible to reliably identify correlations between growth factor levels and clinicopathological data. EGF in the salivary glands is involved in acinar and ductal cell differentiation. Vered et al. detected positive staining for the EGF receptor (EGFR) in ACC salivary glands, suggesting that patients diagnosed with ACC may be candidates for anti-EGFR therapy . Although the sample size of malignant tumours assessed in our study was small and varied, our findings corroborate those of Vered and colleagues, mainly for ACC. A similar relationship between tumor histological type and HGF has been described. According to Tsukinoki et al. , HGF may play an important role in the development of salivary ducts and differentiation of ductal structures of the neoplasms; however, HGF levels in saliva and serum do not allow us to differentiate between benign and malignant tumours. Overexpression of angiogenic growth factors, especially from the heparin-binding growth factor family, is reflected in tumour growth and invasion via an autocrine pathway . We found reciprocal correlations between the salivary levels of the various study molecules, which belong to the same heparin-binding growth factor family. For instance, we observed correlations between salivary levels of VEGF and EGF in pleomorphic adenomas, Warthin’s tumour and malignant tumours. These growth factors may have a similar function and their activation pathways overlap. Correlations between VEGF and HGF, and between EGF and HGFR, in pleomorphic adenoma may reflect increased expression of HGF in mixed tumours compared to other benign salivary gland tumours, a relationship that has been documented in previous studies . In our study, SRSF1 correlated with VEGF levels in benign tumours and with EGF in pleomorphic adenoma. Similar results were obtained by Nowak et al., who found that serine/arginine rich proteins increased the total amount of VEGF . The correlation between SRSF1 and HGFR in malignant and mixed tumours is worth highlighting. Nowak et al. suggested that oncogenes and pro-oncogenes may regulate VEGF expression and could be responsible for the deterioration of the balance of proangiogenic and anti-angiogenic isoforms of VEGF . We did not find any statistically significant differences in the immunohistochemical expression of VEGF165b, VEGFR1, VEGFR2, and CD34 in pleomorphic adenoma, Warthin’s tumour, or malignant tumours. Likewise, we found no correlations between the expression of these molecules and the clinical features of the tumours. In general, expression of anti-angiogenic VEGF165b was the strongest in Warthin’s tumour—a tumour-type that is well-localized and thus characterized by less extensive invasion. Higher expression of anti-angiogenic VEGF165b in this tumour type suggests greater anti-angiogenic properties. Studies have found that a switch from pro- to anti-angiogenic isoforms inhibits tumor growth in vivo. In one study , mice that received injections of A375 melanoma cells transfected with VEGF165 grew larger tumours more quickly than those with VEGF165b; by contrast, mice that received injections of equal amounts of both transfected cell types grew tumour at an intermediate rate. Overexpression of VEGF165b in tumor cells inhibits the growth of several tumors . In our study, expression of VEGF165b in pleomorphic adenoma and malignant tumours was moderate. The splice switch appears in at least two types of cancers (kidney and prostate) but the mechanism that regulates splicing of VEGF is poorly understood. Tayama et al. found that both isoforms were expressed in stromal cells, but the MVD was lower in cases with higher VEGF165b mRNA levels . We did not observe any association between expression of VEGF165b, VEGFR1, and VEGFR2 and MVD (assessed by CD34). These findings confirm those reported by Kurleja et al., who showed that tumor MVD was independent of VEGF expression: in that study, there was no significant correlation between mean CD34 counts and VEGF staining intensity . Previous reports have shown that the results of immunostaining (assessed with various different vascular markers) vary depending on the degree of differentiation of the vascular endothelial cells and degree of vessel maturation. Therefore, when only one antibody is used, some blood vessels or endothelial cells may remain undetected. Moreover, it remains unclear whether normal and cancerous vessels present the same immunoreactivity to various antibodies. Most of our specimens expressed positive staining for CD34 and this expression was independent of VEGF165b, VEGFR1, and VEGFR2 expression. Expression of VEGFR1 was very low in all the tumour samples, in contrast to VEGFR2, which was more widely distributed. Although VEGFR1 binds to VEGF with substantially higher affinity, most of the biological effects of VEGF seem to be mediated by VEGFR2. Ustuner et al. showed higher serum levels of soluble VEGFR1 and VEGFR2 in tumours versus controls and a positive correlation between the serum levels of VEGFR2 and VEGF . Pro- and anti-angiogenic isoforms make up a substantial proportion of total VEGF, ranging from 1 to > 95% in normal human tissues, depending on the location . Lack of these correlations could result from an unknown proportion of VEGF165b in tumour tissues. The main limitation of this study is the small number of malignant tumours. This limitation impeded our ability to check for possible correlations between growth factor levels and clinicopathological data. Consequently, the results reported here need to be verified in larger and more representative patient samples. In parotid saliva, VEGF is the most sensitive growth factor for the diagnosis of parotid gland tumours. However, VEGF cannot be used to identify specific types of parotid gland tumours. Moreover, VEGF levels cannot be used as a prognostic factor because VEFG concentration does not appear to correlate with the clinical parameters of the tumours. However, salivary concentration of VEGF does correlate with the levels of other growth factors; as a result, for comprehensive assessment of angiogenesis, the levels of these other growth factors should also be determined. There are many reciprocal correlations between the various growth factors found in saliva, a finding that reflects their similar and overlapping function. Development of parotid gland tumours is not associated with the deterioration of the balance between proangiogenic and anti-angiogenic VEGF isoforms. The correlation between immunohistochemical expression of VEGF165b and VEGFR2 confirms the function of VEGFR2 in VEGF165b activation. Although we found no differences between tumour tissues and healthy margins (used as controls) in terms of expression of VEGF165b, VEGFR1, VEGFR2, and CD34, these results need to be verified in larger patient samples, particularly with malignant tumours. We would like to thank Bradley Londres for his assistance in editing and improving the English language in this report. We would like to thank Professor Wojciech Golusiński from the Department of Head and Neck Surgery of Greater Poland Cancer Centre, Poznan University of Medical Sciences and Michal Masternak from Burnett School of Biomedical Sciences, College of Medicine, University of Central Florida for their comprehensive assistance in this report. This work was supported by grant no. 502-14-02212331-09591, Department of Oral Surgery, Poznan University of Medical Sciences.